Welcome to October's Meezer Musings! Here in the UK the clocks have just gone back, the days are shorter and colder, and in the northern United States and Canada there's already been snow. 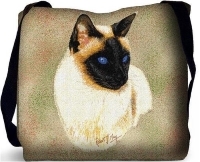 So with winter on the way we're looking ahead to the holiday season with gift ideas for Siamese cats and cat-lovers. We also have Halloween tips for tomorrow and there's news of old friends and our regular 'Meezer of the Month' and 'Fun From Facebook' features. Tomorrow (or today, depending on where and when you're reading this) is Halloween, a time for trick-or-treating, unexpected visitors, extra noise and frightening masks and costumes! Lots of fun for those taking part, but for our pets it's often a different story. And here in the UK, what I call 'firework fortnight' has already begun as we head towards Guy Fawkes Night and its associated bonfires and fireworks - what used to be just one day seems to have extended itself into a two-week firework frenzy! Keep your animals safely indoors. At Halloween you'll be opening your front door more often than usual and it's easy to forget to check where your cats are. So make sure, before the fun begins, that they're safely shut in a room where they won't be affected by the unusual comings and goings and, particularly, won't be able to escape outdoors. Find the quietest room for this. Make a hideout for your cat and create a safe space in the most peaceful room in your house - put your cat's bed, toys, food, water, litter tray and any other comforts in there while the festivities are going on. Keep the noise down. Close windows and doors and draw curtains or blinds to help limit the noise that comes into the house. Keep (yourself and your cat) calm. Calming pheromone plug-ins or sprays like Feliway can help keep your cat calm so spray it around your safe space. Staying calm yourself and not reacting to loud noises also helps to reassure your cat that nothing is wrong. 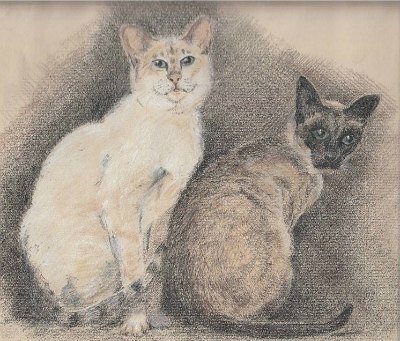 If you've been visiting our site for a while you may have read one or both of reader Gwyn's stories about his cats - Generations of Siamese (about Thomas and Purdy) and What's In A Name? about Nibbles and Boo. Gwyn returned recently with an update on his cats as sadly, both Boo and Nibbles have now passed on. His family now includes Siamese Heidi and Tia and non-Siamese "battle cruiser of a tomcat", Tiger, who has the loudest purr in the world. You can read Gwyn's follow-up, and more about them all here. Gwyn, if you're reading this, I tried to contact you to ask if you'd like to send some photos of your new trio to include with the new page - if so, do please let me know. Gwyn's stories are a powerful reminder that our cats don't stay with us forever and generally don't outlive us; as cat owners, we may have to face up to their loss any number of times throughout our lives. Condolences to Gwyn on the loss of Nibbles, and to others among you whose cats have died recently, or are currently missing. I know of a few of you and won't mention any names here, but you know who you are. The loss of a cat is always heartbreaking and it's so hard to say goodbye; our thoughts go out to you. Our Meezer of the Month for October is Newton, found in a garage in Mexico by Andrea Winter "hiding in a corner behind the doghouse, hissing, covered in burrs, thin, completely terrified". And no wonder, as she was completely alone. Where did she come from? How on earth did she get there? Andrea and her family rescued her and gave her a home, and she now lives in a big house with Andrea's family and three other cats. She's dependent, funny, loves burrowing and climbing onto Andrea's shoulder where she "just sits ...like a little parrot". She's made herself quite at home and the family all adore her! 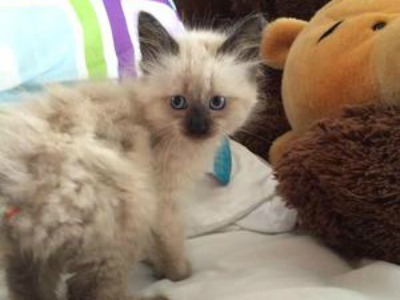 Such a lucky little kitten. You can read more of Newton's story here. Queen Victoria Elizabeth Jane Newton II - or Newton, for short! This month's Fun from Facebook photos should probably be titled "Face to Face"! Donna Sadeghi's kitten Drew is intently studying Skippyjon Jones, and Naila Afaq's Jimmy is equally intently watching Grumpy Cat. 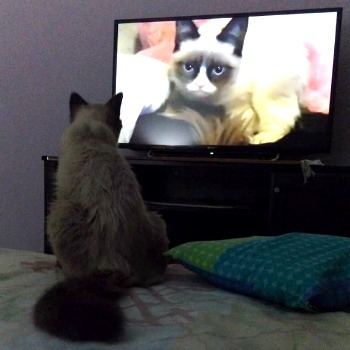 I often wonder whether cats recognize other cats on television, but many cats seem to enjoy watching pet or wildlife shows so there must be some element of recognition. The holiday season will soon be upon us! It's time to start thinking about cards and gifts so I thought we'd finish up this month with a few Siamese-cat-related ideas to get you in a holiday mood. I've always loved the work of artist Suzanne Le Good, who paints gorgeous Siamese, Oriental and Devon Rex cats, amongst other things. I'm about to buy her 2016 Siamese calendar for myself - you can see pictures of its pages below. I thought you might like to know about it too - you can find it on Suzanne's Etsy store here. 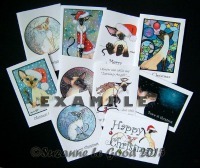 Suzanne also sells Siamese Christmas cards, which come in packs of 10 assorted designs based on her work (the ones shown here are examples only), so a pack or two of these are also going on my Christmas shopping list! 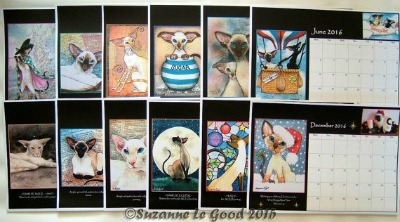 You can find Suzanne's cards here. 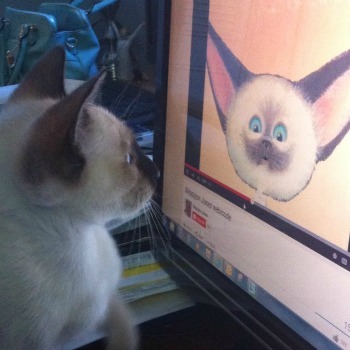 There are of course any number of Siamese-related goodies available on the internet; far too many to list them all here. Below you'll find just a few things I've been looking at recently - mostly small gifts and stocking fillers for kids and adults and all items I would totally buy for myself! For little (and not-so-little!) 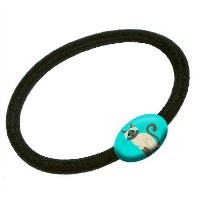 girls this ponytail holder with its turquoise bobble and cartoon Siamese cat is very cute and would make a great stocking filler. In the toy category, here's another lovely little-stocking filler, an 8" plush Siamese kitten with its very own leopard print fleece bed. 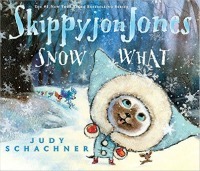 If it's books you're after, the latest in Judy Schachner's Skippyjon Jones series is 'Snow What'. Re-telling the story of Snow White and the Seven Dwarves in Judy's inimitable fashion with Skippy's chihuahua friends in the role of the Seven Dwarves. Here in the UK supermarkets have just started charging us for plastic carrier bags - an incentive, if any were needed, to take your own bags with you. Environmentally sound, strong and sturdy and pretty too. 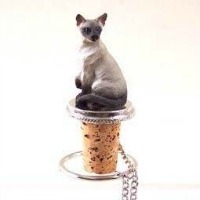 For the Siamese wine lover in your life, how about a wine-bottle stopper? I like these although I'm not sure how much they'd be used as opened wine doesn't last long in our house! 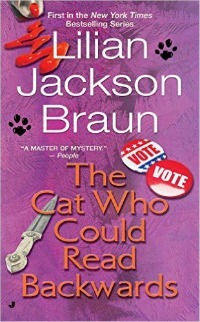 If you (or someone you know) is a lover of Lilian Jackson Braun's detective stories featuring Jim Qwilleran, his Siamese cats Koko and Yum-Yum and an assorted cast of extraordinary characters, you might like to know that the whole series has been re-released both in paperback and now also on Kindle, which is very exciting news! You'll find the complete list here . 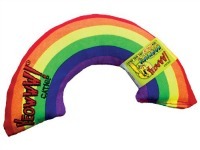 Gifts for meezers - Bandit's picks! Bandit doesn't play with toys much these days. At twelve, perhaps he feels he's too old for such trifles! Here are three things he does love, so if you're looking for a gift for the cat in your life these come with Bandit's seal of approval. This is probably one of Bandit's most favorite things ever. When he first arrived from the rescue he was provided with a small catnip mouse that he loved and played with all the time, but that didn't last long! 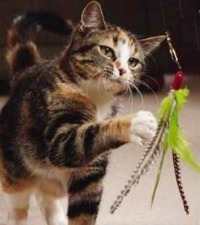 Yeowww also do banana-shaped catnip toys and we've tried one of those too, but Bandit didn't play with that as much. This rainbow is definitely his top choice! The only thing I would add is that cats love them so much that they don't last long, particularly if you've got a 'chewy' kind of cat, so it's worth buying the pack of three refills, too, if you think your cat would enjoy this. 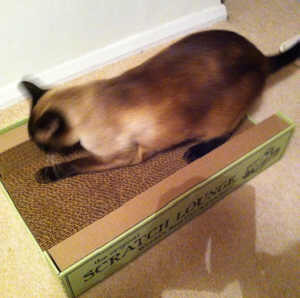 The Scratch Lounge, marketed as 'The World's Best Cat Scratcher', is a real hit here, as you can see (this is Bandit). It's a great product, well-made and very sturdy. The surfaces are reversible so you can turn them round once they're worn, and you can even buy replacement pads. It has great reviews from others saying how much their cats also loved it and that it had saved many a piece of furniture from destruction! Bandit has rarely scratched our furniture, but he does have a large upright scratching post - however if anything, he likes the Scratch Lounge better. It's nearly time to send this out, so we'll finish by wishing you a very happy Halloween; have fun if you're partying or out trick-or-treating but keep yourselves and your animals comfortable and safe. We'll be back towards the end of November for our last newsletter of the year before Thanksgiving, Christmas and the other holidays and all their associated festivities begin.